Giving in Minnesota is the Minnesota Council on Foundation's definitive report on charitable giving in Minnesota with the latest figures on grantmaking by individual donors, foundations and corporate grantmakers. 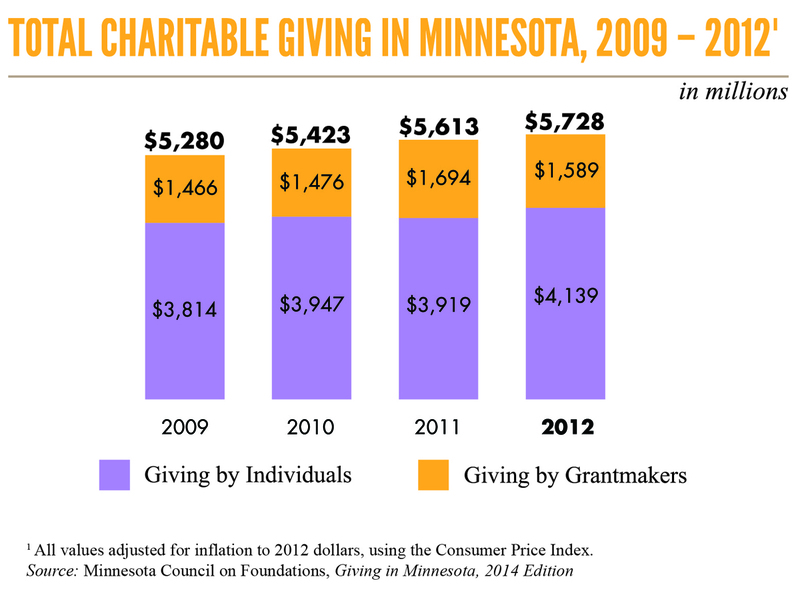 The most recent issue of Giving in Minnesota was published in 2014 with 2012 data. 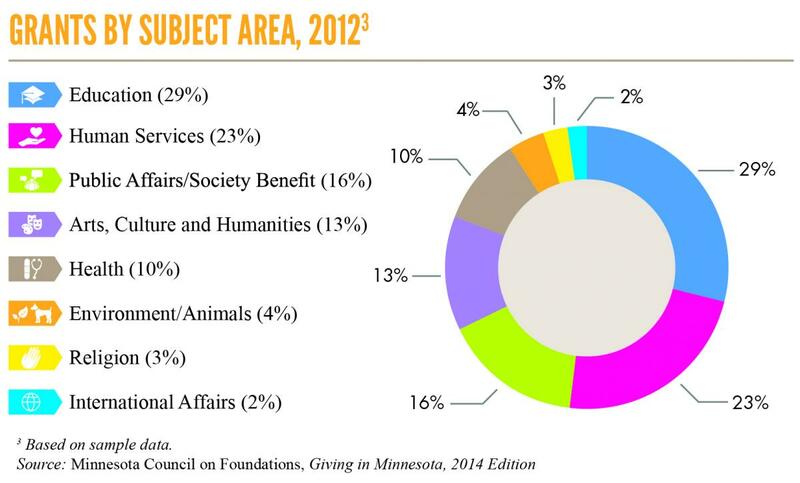 Giving in Minnesota is a comprehensive analysis of the trends in giving by organized philanthropy in the state. According to MCF's Giving in Minnesota, 2014 Edition research, individuals, foundations and corporations gave $5.7 billion in 2012, a 2-percent increase in total giving over 2011. Individual giving went up to $4.1 billion in 2012, while grantmaking by foundations and corporations in Minnesota declined by 6 percent to $1.6 billion. Part of the reason for 2012’s decline in grantmaking has to do with the Margaret A. Cargill Foundation. In 2011, it paid $142 million in 400 one-time, multiyear grants; in 2012, it granted $42 million. The foundation is launching and growing its programs gradually, and if its grants were not included in 2011 or 2012, grantmaking would have remained flat between the two years. Education continued to receive the largest share (29 percent), followed by human services (23 percent) and public affairs/society benefit (16 percent). In 2012, 48 percent of Minnesota grant dollars went to organizations and programs serving the state; 47 percent was distributed to groups serving other parts of the U.S., and 6 percent supported international causes. Corporations tend to distribute grants more widely than other types of grantmakers. 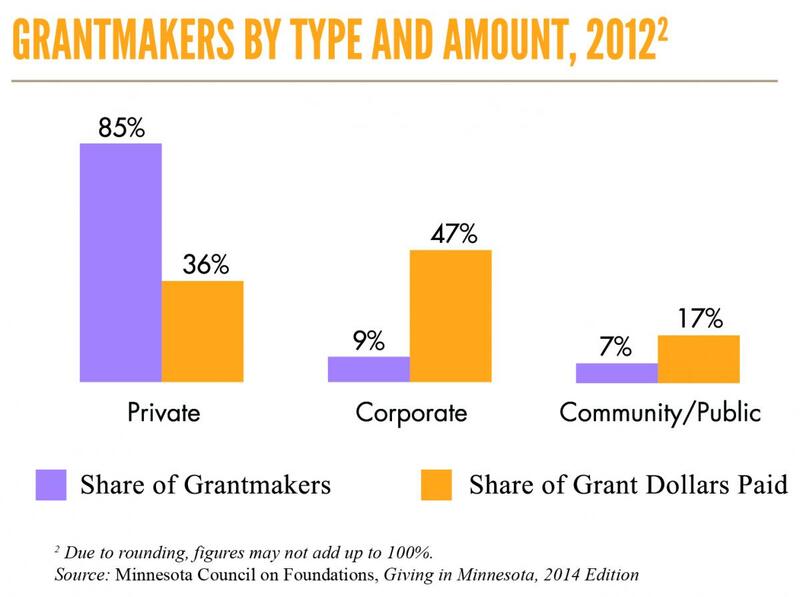 Corporate grantmaking is vital in Minnesota. In 2012, company foundations and giving programs comprised just 9 percent of the state’s 1,450 grantmakers, but they gave 47 percent of all grant dollars. By contrast, private foundations made up 85 percent of Minnesota’s grantmakers and gave 36 percent of all 2012 grant dollars. Community and public foundations accounted for the remaining 17 percent of giving.